In Part 1: What to Look For we gave our advice about choosing the perfect cabin for your stay, and passed along some real-life tips from our guests. Now let’s look at how to get the best value for your cabin. The sure way to get exactly what you want from a cabin is to book well in advance. Cabin availability goes down the shorter notice you give to your search, and the choices become more limited. Cabins DO sell out completely, especially at high-season times and holidays. Returning visitors to the Smoky Mountains – and there are millions of these – will often ask for a favorite cabin by name and sometimes book it more than a year in advance. When you book far in advance, most special offers don’t apply. At Cabins of the Smoky Mountains, we do offer a 10% discount for returning guests and military personnel. Also, we have a standing, year-round offer that allows you to book six nights for the price of five. Most of the other specials are usually last-minute deals based on availability. As with the hospitality industry all over the world, prices go down for unsold lodging at the last minute. This is especially true in low seasons – the slower times between the prime seasons. For current specials, keep an eye on the Special Deals & Last-Minute Offers Page in our web site, and see our announcements in our Facebook page for example. We never know in advance about last-minute deals, and these tend to be WEEKEND specials for Friday through Sunday nights. We do often run WEEKDAY specials however, Monday through Thursday, and these can be as much as two months in advance. A weekday trip in the off-season is a good way to plan a stay and still get significant discounts – such as 4 nights for the price of 2 nights! The specials are only good for people with the flexibility to take advantage of them. If you’re traveling to the Smokies from a long distance, have specific requirements or want the best choice of cabin, planning ahead rather than gambling on specials for remaining cabins is the way for you. But if you live within a reasonable drive from our location, and you hear of, say, a Half-Price weekend on remaining cabins with a couple of days notice, it’s feasible to think about taking a weekend excursion, and many people do. Also, if you find yourself acting at the last minute and can’t find what you want on the web site, it always pays to call us (866-34-SMOKY, open 24/7), because there can sometimes be last-minute cancellations and changes. And we’ll try hard to fit your budget! 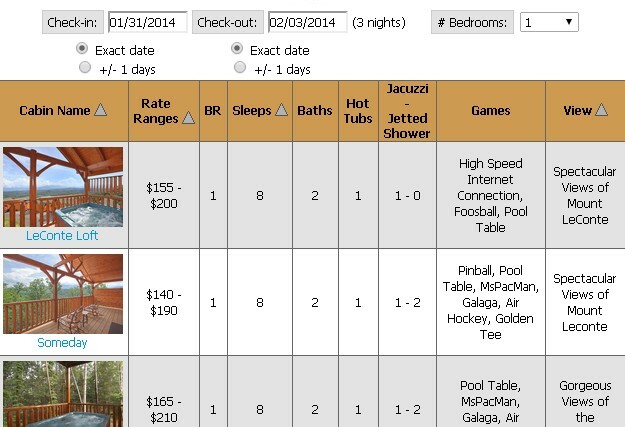 The Specials page in the Cabin of the Smoky Mountains web site tells you what offers are current, and the search tool at the bottom of the page quickly shows you which cabins are available. This page and all the cabin pages are updated in real time. However, always call us with any questions – calling ahead is the recommended best practice for a successful stay! You can sort the list by Name, Rate Range, Sleeps and View. Don’t rely exclusively on the Rate Ranges, because cabins have different prices, and they can have special rates already applying as well as the last-minute specials, as we’ll see next. 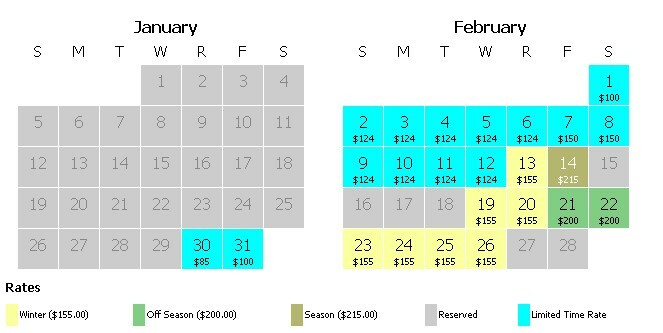 Notice that the Rates legend shows that this cabin in winter runs $155 per night – and in the list the Rate Range was $155-200 – but here we see the bright blue “Limited Time Rate” for Jan 30 through Feb 12. This cabin is already much lower than the rate range we would have thought from the list of cabins in our search – so it pays to click through on cabins that catch your eye. Now let’s apply the specials to the displayed price. RULE: When there’s a special, take the listed price in the calendar and apply the special to it. If we want a weekday stay Monday through Thursday, Feb 3-6, the listed rate is $124 per night. BUT we have a “Buy 2 Nights Get 2 Nights Free” special currently in effect. So if we stay 4 nights, $124 becomes $62. We could get this 1-bedroom cabin (that sleeps 8 people in comfort) for $62 per night! There will be a cleaning fee and taxes on top of this amount, but even so, it looks like that tip from a guest in Part 1 was correct – there ARE some great deals to be found in the specials! Now let’s look at the weekend possibilities. Friday through Sunday night the rates are $100-124, and there’s a 50% special running for this weekend. We found this cabin on Wednesday evening, and if we can be in Gatlinburg by Friday evening we could spend a 3-night weekend in the Smoky Mountains for $162, plus fees and taxes. There’s usually a 2-night minimum for a special offer to apply, but even with this condition we could also do just a Friday & Saturday night stay for $50 per night base price if we chose – that’s pretty good for a luxury cabin in the Smokies! Now we’ve found a perfect deal on a perfect cabin, this is the point that we pick up the phone and call toll-free 866-34-SMOKY (866-347-6659), and talk to one of the friendly staff to confirm. TIP: we can help you find this deal at any stage of the search – always feel free to call and let us help you. It pays to know how the rates work, and it pays to explore the cabins on the web site as thoroughly as you can to get an idea of amenities. And then it pays to call us to help you find the perfect cabin for you needs. And then you’re done! How Far is Gatlinburg from Atlanta? What’s the Best Drive?